อาร์คีออปเทอริกซ์ (Archaeopteryx, /ˌɑrkiːˈɒptərɪks/ ar-kee-op-tər-iks) หรือที่รู้จักกันในชื่อภาษาเยอรมันว่า Urvogel (ออกเสียง:อูร์ฟอเกิล, แปลว่า "นกต้นกำเนิด" หรือ "นกชนิดแรก") เป็นสกุลของไดโนเสาร์เทอโรพอดซึ่งเป็นญาติใกล้ชิดกับนก ชื่อมาจากภาษากรีกโบราณ ἀρχαῖος (archaīos) แปลว่า "เก่าแก่โบราณ" และ πτέρυξ (ptéryx) แปลว่า "ขน" หรือ "ปีก"
ชิ้นตัวอย่างเบอร์ลิน (HMN 1880) ถูกค้นพบในปี 1876 หรือ 1877 ที่ Blumenberg ใกล้ Eichstätt ในเยอรมนี โดย Jakob Niemeyer เขาแลกเปลี่ยนชิ้นฟอสซิลที่มีค่านี้กับแม่วัวตัวหนึ่งกับ Johann Dörr ต่อมาถูกวางขายในปี 1881 โดยมีผู้เสนอซื้อหลายคนรวมถึง Othniel Charles Marsh จากพิพิธภัณฑ์พีบอดีของมหาวิทยาลัยเยล แต่มันถูกซื้อไปโดยพิพิธภัณฑ์ประวัติศาสตร์ธรรมชาติฮัมโบลดต์ซึ่งปัจจุบันก็ถูกจัดแสดงไว้ที่นั่น โดยมีผู้ให้การสนับสนุนด้านการเงินในการจัดซื้อโดย Ernst Werner von Siemens ผู้ก่อตั้งบริษัท Siemen AG ที่มีชื่อเสียงซึ่งตั้งชื่อตามชื่อของเขา Described in 1884 by Wilhelm Dames, it is the most complete specimen, and the first with a complete head. Once classified as a new species, A. siemensii, a recent evaluation supports the A. siemensii species definition. ↑ Archaeopteryx lithographica - Nick Longrich, University of Calgary. Discusses how many wings an Archaeopteryx had and other questions. ↑ 7.0 7.1 7.2 7.3 7.4 Lambert, David (1993). The Ultimate Dinosaur Book. New York: Dorling Kindersley. pp. 38–81. ISBN 1-56458-304-X. ↑ Holtz, Thomas, Jr. (1995). "Archaeopteryxs Relationship With Modern Birds". Journal of Dinosaur Paleontology. สืบค้นเมื่อ 2007-03-01. ↑ Feduccia, A. (1993). Evidence from claw geometry indicating arboreal habits of Archaeopteryx. Science. 259(5096): 790–793. ↑ Feduccia, A. & Tordoff, H.B. (1979). Feathers of Archaeopteryx: Asymmetric vanes indicate aerodynamic function. Science. 203(4384): 1021–1022. ↑ Huxley T.H. (1868). On the animals which are most nearly intermediate between birds and reptiles. Geol. Mag. 5, 357–65; Annals & Magazine of Nat Hist 2, 66–75; Scientific Memoirs 3, 3–13. ↑ Huxley T.H. (1868) Remarks upon Archaeopteryx lithographica. Proc Roy Soc 16, 243–48; Sci Memoirs 3, 340-45. ↑ Huxley T.H. (1870) Further evidence of the affinity between the dinosaurian reptiles and birds. Quart J Geol Soc 26, 32–50; Sci Mem 3, 487–509. ↑ Kennedy, Elaine (2000). 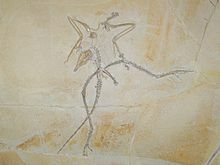 Solnhofen Limestone: Home of Archaeopteryx. Geoscience Reports. 30: 1–4. Retrieved 2006-10-18. ↑ Nedin, C. (1999). All About Archaeopteryx. talk.origins archive. Version of June 10, 2002; retrieved 2006-10-18. ↑ Ostrom, J.H. (1976). Archaeopteryx and the origin of birds. Biol. J. Linn. Soc.. 8: 91–182. ↑ Ostrom, J.H. (1985). Introduction to Archaeopteryx. In: Hecht, M.K.O. ; Ostrom, J.H. ; Viohl, G. & Wellnhofer, P. (eds.) The Beginnings of Birds: Proceedings of the International Archaeopteryx Conference: 9–20. Eichstätt, Freunde des Jura-Museums Eichstätt. ↑ Owen, R. (1863). On the Archaeopteryx of Von Meyer, with a description of the fossil remains of a long-tailed species from the lithographic stone of Solnhofen. Phil. Trans. Roy. Soc. London. 153: 33–47. ↑ 24.0 24.1 Elżanowski A. 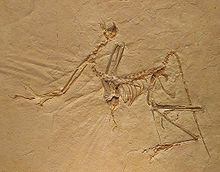 (2002): Archaeopterygidae (Upper Jurassic of Germany). In: Chiappe, L. M. & Witmer, L. M (eds. ), Mesozoic Birds: Above the Heads of Dinosaurs: 129–159. University of California Press, Berkeley. ↑ 28.0 28.1 28.2 28.3 Chiappe, Luis M. (2007). Glorified Dinosaurs. Sydney: UNSW Press. pp. 118–146. ISBN 0-471-24723-5. ↑ 30.0 30.1 Bartell K.W., Swinburne N.H.M. and Conway-Morris S. 1990. Solnhofen: a study in Mesozoic palaeontology. Cambridge (transl. and revised from Bartel K.W. 1978. Ein Blick in die Erdgeschichte. Ott. ↑ Ostrom, J.H. (1976). "Archaeopteryx and the origin of birds". Biological Journal of the Linnean Society. 8: 91–182. doi:10.1111/j.1095-8312.1976.tb00244.x. ↑ National Geographic News- Earliest Bird Had Feet Like Dinosaur, Fossil Shows - Nicholas Bakalar, December 1, 2005, Page 1. Retrieved 2006-10-18. ↑ 35.0 35.1 Griffiths, P. J. (1996). 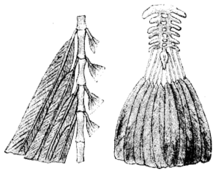 The Isolated Archaeopteryx Feather. Archaeopteryx 14: 1–26. ↑ Darwin, Charles (1859). On the Origin of Species. John Murray. ↑ National Geographic News- Earliest Bird Had Feet Like Dinosaur, Fossil Shows - Nicholas Bakalar, December 1, 2005, Page 2. Retrieved 2006-10-18. ↑ 41.0 41.1 41.2 Mayr, G., Phol, B., Hartman, S. & Peters, D.S. (2007). The tenth skeletal specimen of Archaeopteryx. Zoological Journal of the Linnean Society, 149, 97–116. ↑ Swinton, W. E. (1960). Opinion 1084, Proposed addition of the generic name Archaeopteryx VON MEYER, 1861 and the specific name Lithographica, VON MEYER, 1861, as published in the binomen Archaeopteryx Lithographica to the official lists (Class Aves). Bulletin of Zoological Nomenclature 17(6–8): 224–226. ↑ ICZN. (1961). Opinion 607, Archaeopteryx VON MEYER, 1861 (Aves); Addition to the Official list. Bulletin of Zoological Nomenclature 18(4): 260–261. ↑ ICZN. (1977). Opinion 1070. Conservation of Archaeopteryx lithographica VON MEYER 1861 (Aves). Bulletin of Zoological Nomenclature 33: 165–166. ↑ Archaeopteryx turns out to be singular bird of a feather. New Scientist 2443:17. 17 April 2004. See commentary on article. ↑ 52.0 52.1 52.2 Nedin, Chris (2007-12-15). "On Archaeopteryx, Astronomers, and Forgery". สืบค้นเมื่อ 2007-03-17. ↑ Chatterjee, Sankar (1991). "Cranial anatomy and relationships of a new Triassic bird from Texas". Phil. Trans. R. Soc. B. 332 (1265): 277–342. ↑ Ostrom, J. H. (1996). "The questionable validity of Protoavis". Archaeopteryx. 14: 39–42. ↑ Lowe, P. R. (1935). "On the relationship of the Struthiones to the dinosaurs and to the rest of the avian class, with special reference to the position of Archaeopteryx". Ibis. 5 (2): 398–432. doi:10.1111/j.1474-919X.1935.tb02979.x. ↑ Thulborn, R. A. (1984). "The avian relationships of Archaeopteryx, and the origin of birds". Zoological Journal of the Linnean Society. 82 (1–2): 119–158. doi:10.1111/j.1096-3642.1984.tb00539.x. ↑ Kurzanov, S. M. (1987). "Avimimidae and the problem of the origin of birds". Transactions of the joint Soviet-Mongolian Paleontological Expedition. 31: 31–94. ISSN 0320-2305. ↑ Barsbold, Rhinchen (1983). "Carnivorous dinosaurs from the Cretaceous of Mongolia". Transactions of the joint Soviet-Mongolian Paleontological Expedition. 19: 5–119. ISSN 0320-2305.
von Meyer, H. (1861). Archaeopteryx litographica (Vogel-Feder) und Pterodactylus von Solenhofen. Neues Jahrbuch für Mineralogie, Geognosie, Geologie und Petrefakten-Kunde. 1861: 678–679, plate V [Article in German] Fulltext at Google Books. Shipman, P. (1998). Taking Wing: Archaeopteryx and the Evolution of Bird Flight. Weidenfeld & Nicolson, London. ISBN 0-297-84156-4. หน้านี้แก้ไขล่าสุดเมื่อวันที่ 7 มิถุนายน 2558 เวลา 05:56 น.